At Rush, the longstanding Parkinson’s Disease and Movement Disorders Program has a strong commitment to studying new treatments for patients with Parkinson’s disease. Because the scientific questions and patient concerns change during the course of this disease, a comprehensive program needs to have multiple programs testing new therapies. In the early phase of Parkinson’s disease, when symptoms are very mild, the primary research focus is to develop interventions that halt or slow the progression of disability. In the midpoint of the disease, improved treatments of the core signs of Parkinson’s disease become the focus, because tremor, slowness, stiffness and balance difficulties can be inadequately controlled by currently available medications. In the advanced stages of Parkinson’s disease, concerns focus increasingly on non-motor concerns such as cognitive problems, apathy and hallucinations. Many patients and their families participate in research to gain access to these new treatments and to advance the scientific understanding of Parkinson’s disease for the good of all people in the world with this disease. These research studies provide not only the possibility of a new treatment, but research subjects spend more time with staff, receive education, and often meet other research subjects, thereby broadening their understanding and empowerment. With many years of experience in clinical research, when my patients ask me if they can participate in our clinical trials, I review the available trials that best fit the problems they are facing. We do not know whether this new treatment will work. If you join the program, your job will be to report what happens accurately. If changes occur, I need to know about them, but if no change occurs, this information is equally important. If you participate, we will work together, and we can hope that the treatment will work. However, we cannot expect the treatment to work. We are not here to prove that a treatment works, but to test if a treatment works. The partnership established in research is an important one. There is no doubt patients who volunteer for research programs need to visit our center more often than they would for regular care, and they need to focus on accurate reporting with special commitment. Research treatment protocols are not suitable for all patients, but I have found that many of our patients come to Rush specifically because we offer research programs. Even for those who do not participate, our regular newsletter, office information sheets, and patient/caregiver support group provide venues for learning about research that is ongoing and planned for the future. 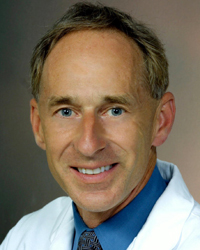 Christopher Goetz, MD, is director of the Parkinson’s Disease and Movement Disorders Program at Rush University Medical Center. This entry was posted in Neurology and tagged clinical trials, movement disorders, Parkinson's disease. Bookmark the permalink.